The speed and veracity of Dion Fortune’s response to Britain’s declaration of war with Germany in 1939 is quite astonishing, as if she had been spiritually primed for such a moment. With Churchilllian poise and timing she began a series of remarkable epistles to her peers in the Fraternity of the Inner Light, a sisterly spin-off of the Hermetic Order of the Golden Dawn. These letters have since become a valuable testament not just to the irascible will of a spiritual leader in galvanizing her group but also the larger resolve of a nation under the threat of hostile invasion. With planes carrying destructive bombs flying overhead Fortune exhorts would-be flyers on the metaphysical planes to invoke a group-soul umbrella of protection to repel the intruders. Thus begins The Magical Battle of Britain. Skylight Press is thrilled to reissue an all-new edition of these invaluable letters that are still so relevant on the historical and anthropological level as well as being an esoteric masterpiece. The book, which bears an introduction and commentary by Fortune’s protégé, Gareth Knight, has become an occult classic since its initial release by Golden Gates Press and subsequent reprints by Arcania Press and Sun Chalice Books. Not just being a marvellous documentation of the encroachment of world war and the unfolding of all its subsequent battles and phases, the work is also an informative seeker’s guide on seeding the consciousness, working with archetypal images and symbols, as well as defensive psychic ritual and mind-working. The letters and their self-contained optimism survive the Blitz both literally and figuratively. But through her guiding light in dark days Fortune amalgamates a truth that outlasts the trappings of this particular war and becomes a blueprint with which to empower the mind in all times and places, through all battles – great or small. Through connectivity, solidarity, understanding and enlightenment, Fortune shows how a vulnerable island consciousness, a metaphor for the singular plight of man, can be steeled and fortified against all invading forces, whether physical or spiritual. In a world riddled with an artful propaganda that manifests its own powerful images and symbols, Fortune begins her letters by instructing us how to implant our own mental antidotes using combative images and symbols. Taking full advantage of military analogies and metaphors Fortune seeks to fortify the mental barracks and build a disciplined magical army, leading the troops through each air raid and bomb blast, playing the ardent sergeant major when morale flags or the task begins to seem daunting. In later letters, as the army gains strength and confidence, the forays into enemy territory become more ambitious, matching the advancing movement of the allies across Europe. The letters are cleverly interspersed with small historical telegrams from the editor, showing how the mind of this magus and her meditational group of followers worked in concert with the entire theatre of war. There is no doubt the Dion Fortune strongly believed that there were dark magical forces at work in the enemy camp – but she never lapses into sensationalism or histrionic hyperbole at any point. Speculation about Nazi occultism was rife at the time as it has been increasingly so ever since. Numerous books like The Morning of the Magicians and The Spear of Destiny surfaced some years later and a genre of crypto-history was born. Yet although she accords Hitler and his generals a working knowledge of occult power she resists the temptation to excogitate a theorem or schema about such power except to say that she presumes it to contain some sophistication. Much has been surmised about the Third Reich and its relationship to Teutonic philosophy, Grail myth, and dark occultism despite that fact that Hitler was a practising Catholic. But Fortune does not empower any of these suppositions by needless naming and speculation, choosing instead to concentrate on the strength and fortitude of her own forces. In such, the book is a powerful treatise on how to unhinge the powerful leverage of propaganda, rumour, and hype. 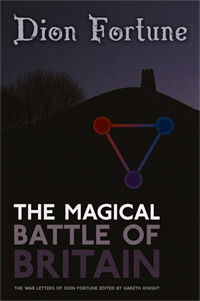 The Magical Battle of Britain is a beautifully rendered book and wonderfully presented and edited by Gareth Knight. Knight facilitates the power of the book by showing great restraint in his addended commentary, always letting the letters speak for themselves. His editorials are short, precise and informational, providing context where it is needed. The encapsulated war updates are fascinating and perfectly infused with the text, giving the letters historical scope and gravitas. This unique work is a national treasure. The Magical Battle of Britain: The War Letters of Dion Fortune is available from various retail outlets such as Amazon, Amazon UK, Waterstones online, or direct from the Skylight Press website. This entry was posted in British Literature, Esoteric, Literature, New authors, New books, Recommended reads and tagged archetypal images, British History, British Literature, British mysteries, British Novel, Dion Fortune, esoteric, fiction, fraternity of the inner light, Gareth Knight, Glastonbury Tor, Golden Dawn, hermetic order of the golden dawn, Magic, magical battle, Mediumship, Moon Magic, New authors, Occult, order of the golden dawn, Psychology, Qabalah, Sea Priestess, Society of Inner Light, Theosophy, trance mediumship, Uncategorized | Tagged Battle of Britain, violet mary firth, Western Mysteries, World War Two. Bookmark the permalink.